If your library has the Recommend to library feature, use the steps below to browse and recommend digital titles that your library doesn't own. When you recommend a title to your library, there is no guarantee they will purchase it. You can't recommend magazines through the Recommend to library feature. Run a search in your library's digital collection. On the results page, select Recommend to library under the "Availability" filter. Titles your library doesn't own are added to your results. 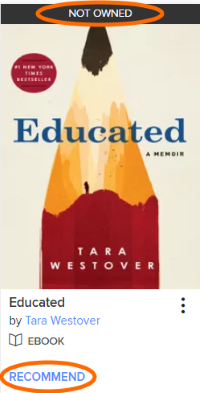 To tell which titles aren't part of the digital collection, look for a Not owned banner and Recommend link. Click or tap Recommend to recommend a title. If prompted, enter and confirm your email address. Then, select Recommend. 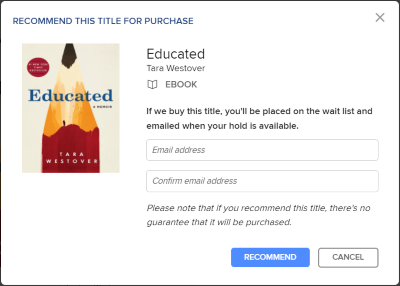 If your library buys the title, you'll be added to its wait list and receive an email when your hold is available. To see the titles you've recommended, select , then Recommendations. You'll also see how many more titles you can recommend (or when you can recommend titles again). If your library doesn't have the Recommend to library feature, talk to a library staff member about how you can suggest new titles. If your library has the Recommend feature, use the steps below to browse and recommend digital titles that your library doesn't own. Note: If you recommend a title to your library, there is no guarantee they will purchase it. On the results page, select Additional Titles to Recommend under the "Show me" filter. Titles your library doesn't own are added to your results. 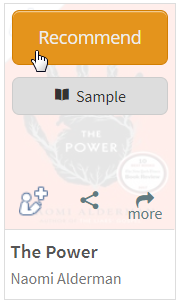 To determine which titles you can recommend to your library, look for the recommend icon. To recommend a title, mouse over it (or tap it, on a mobile device) and select the Recommend button. If prompted, sign in. On the page that opens, enter and confirm your email address. Select Recommend this title to complete your recommendation. 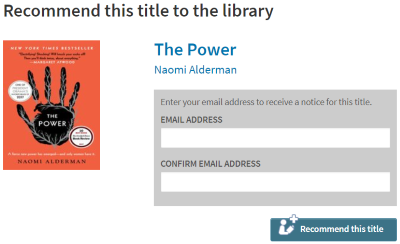 If your library buys the title, you'll be added to its wait list and receive an email when your hold is available. Your library can limit how many titles you're allowed to recommend in a given period of time, so if you've hit your limit, just wait a few days, then try again. You can view a list of titles you've recommended under your Account > Lists > Titles you recommended. 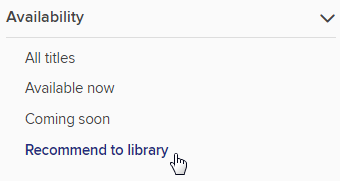 Once you recommend a title to your library, you cannot remove it from your "Titles you recommended" list because your library has already been alerted that you've made the request. If your library doesn't have the Recommend feature, talk to a library staff member about how you can provide suggestions for new titles.